Next month Roy Williams and I will give the keynote presentation at a conference in Graz, Austria, which will focus on learning in open learning environments; how we recognize, value and ‘capture’ it. This is the second in a series of posts that we will make in preparation for this keynote. We have been thinking about what might be the key characteristics of learning in open learning environments since 2008. One of the first visualizations that I became aware of at that time, was the map created by Matthias Melcher during CCK08. CCK08 was the first MOOC on Connectivism and Connective knowledge, convened by Stephen Downes and George Siemens in 2008. For me, this was my introduction to ‘learning in the open’. This is Matthias’ map. My way of approaching the confusing landscape of countless tools, sites, and resources, was to try and get a visual overview of the salient ones. On reflection, it is interesting that open learning environments can lead to learning in more closed, private, collaborative (as opposed to cooperative), spaces. Since CCK08 this has often been my experience and has led to some of my most significant and fruitful learning experiences. I think this has also influenced how we (Roy and I) have written about the characteristics of open learning environments. We acknowledge the role of seemingly ‘non-open’ factors such as solitude and contemplation and the role of prescribed learning, and are interested in the balance between more prescribed, closed environments and open learning environments. We do not claim that learning in the open is superior to learning in more closed environments or vice versa. We are interested in how and why they are different and in the affordances of both open and more prescribed learning environments. We also recognize that learners will move between open and closed learning environments. Working across distributed platforms, as depicted by Matthias’ map, is a characteristic of open learning environments that has also been highlighted by Stephen Downes. In addition Stephen has always said that the key principles of an open networked learning environment (a cMOOC) are autonomy, diversity, openness and interaction/connectivity. These four principles have been influential in our thinking about the characteristics of open learning environments. They, along with our past experience and prior knowledge of various learning theories, were our starting point. Open/Structure: What is the balance between Openness and Structure? Interactive environment: How is the learning design implemented? Agency: Do learners develop their own capacity for action, or just compliance with given roles? Presence/writing: What traces do you make and leave behind you? The Table below lists the factors arranged into clusters. In our publications and on our open wiki, each of these factors comes with a description and question (see references at the end of this post). Our thinking about open learning environments and the factors that influence learning within these environments is ongoing, so we do not see this list of factors as definitive. We offer them as a palette, rather like an artist’s palette of colours, to be selected from according to the most useful and appropriate in any given context. We also recognize that the palette might be added to or the factors changed. Our experience is, though, that a consideration of the complete list of 25 factors provides the richest picture of learning in an open environment. 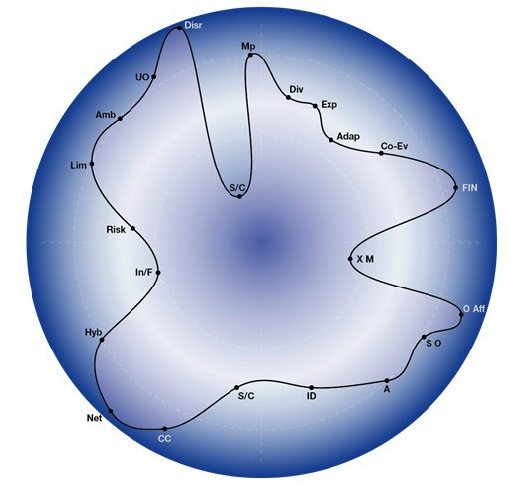 We visualize this picture as a Footprint of Emergence , as depicted below. This ‘Footprint’ is a visualization of experience of learning in the Connectivism and Connective Knowledge MOOC (CCK08). On the Footprint image, factors can be seen as points (black dots) located on the footprint line within the circle. Each factor relates to the list of factors above, but is represented on the image by an abbreviation. So ‘Lim’ relates to Liminal space and ‘Amb’ to ambiguity and so on. 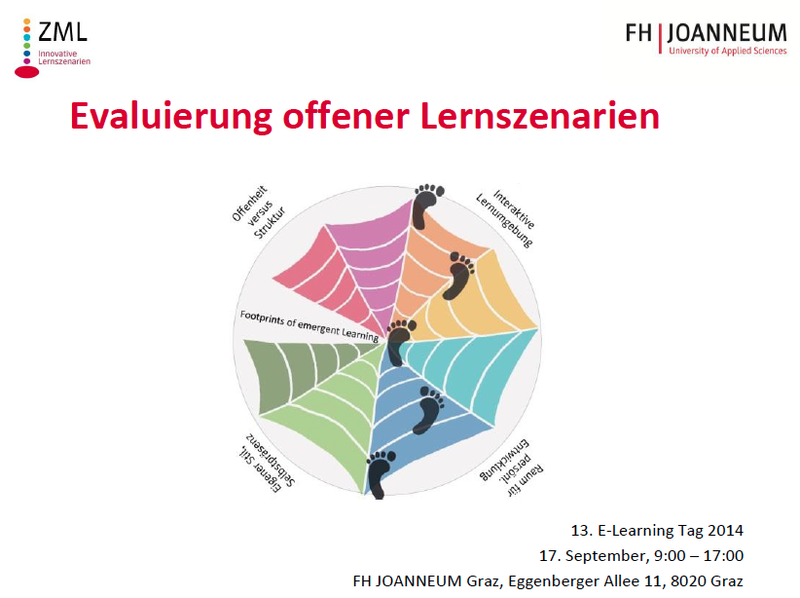 To interpret and understand the footprint visualization, we need to know that in the dark centre of the circle learning is experienced as prescribed. In the white zone learning is experienced as ‘sweetly’ emergent. Moving outwards from the white zone to the darker blue zone, learning is experienced as more challenging and ‘sharply’ emergent. On the dark outer edge of the circle learning is experienced as chaotic. CCK08 was designed to be open and challenging, and therefore it is no surprise that most of the characteristics/factors that we have identified were experienced as being between sweetly emergent and chaotic, for the point in time at which this footprint was drawn in the course. Footprints visualize an instant in time. We have provided details of how to draw footprints of emergence on our open wiki  and in this video below. The footprint visualization makes explicit the relationship between open emergent learning and closed, prescribed learning. If, as we believe, open learning environments lead to increasing incidents of emergent learning (I will come back to this in my next blog post), then we, as learners, teachers and designers, need to know more about what this learning might entail, how we will recognize it and how we will value it. Excellent blog post Jenny, pulls together some salient features of open learning environments, especially re-iterating Downes autonomy, diversity, openness, connectedness. I am interested in the openness / structure tension. My view as a practicing teacher, pre-TEL, was that I should enable the learner to understand the structures of education so that they could map their own way through. I was perhaps, showing them how to be open (informal) learners in a world of closed (formal) structured learning environments. 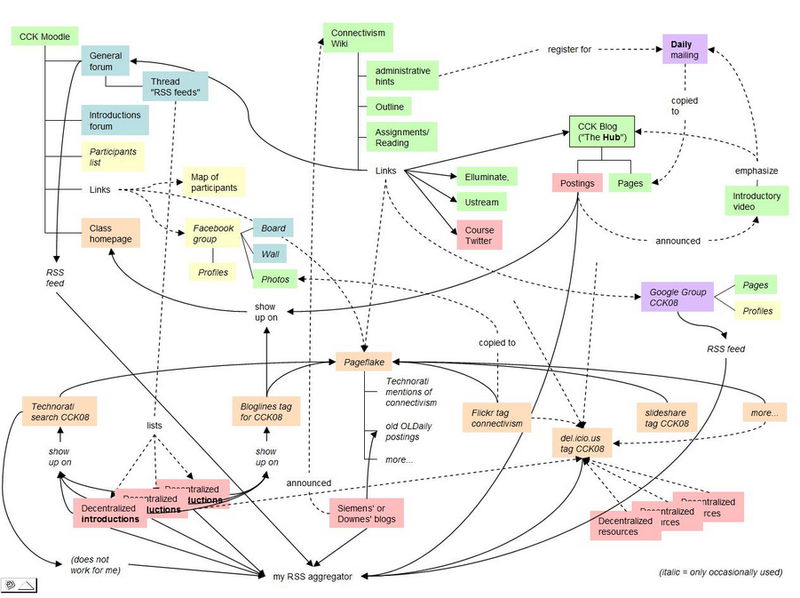 Something I have been learning on the WikiQuals project is how differently each (learner) regards structure. The whole process of inducting them into self-managed learning revolves around a discussion on this very point of the tension between open & structure. Where structured learning environments have a benefit is in reducing the cognitive overhead involved in learning; I dont need to think about my learning because it is embedded in the education system I have been socialised into. The reason xMOOCs have exploded whilst cMOOCs grow steadily is that the cognitive overhead is lower. Learners are so used to badly structured (arguably abusive) learning environments from the education system, that they can adapt to xMOOCS easily, because there is no additional individual overhead, which there is in self-managed learning in open learning environments. There was a famous book about web-design called “Don’t Make Me Think” and it seems to me that learners who have learnt in formal structured learning environments of the existing education systems bring that attitude to open learning. “Don’t Make Me Think” about learning when I am involved in education. So potential open learners need to be re-sensitised to what learning entails, as we try to make a shift to learner-centric emergent learning and away from institution-centric structured education. Fred – thanks for these helpful comments. 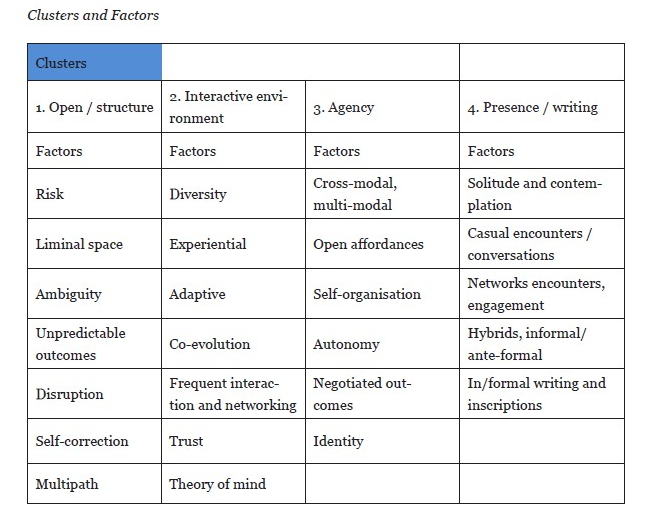 The open/structure cluster of factors was the first we worked on, and I agree about the tension between openness and structure, although we talk/write more about finding a balance than treating this necessarily as a potential problem. Hopefully the process of drawing a footprint helps to explore and visualise this process. One of the factors that we often find ourselves discussing in the open/structure cluster is ‘risk’. Maybe it’s not so much ‘Don’t make me think’, as ‘I’m scared (or simply don’t like) to think in the open, where everyone can see my limitations’. Recently I have been thinking that this is particularly the case for introverts. I sometimes think that open learning seems to favour those who are extroverts and love a party. http://learning-affordances.wikispaces.com/Speaking%20of%20Openness – and which I think help to raise some of the issues around ‘learner-centric emergent learning’. I’m learning a lot about open/structure from my new WikiSqolars who are both very successful in traditional education and inherently resistant to open. The useful thing for me with WikiQuals (we ran a workshop at the Wikipedia Conference in London) is that I have to counsel each new person into Sqolarly practice, so I have to investigate individual attitudes to open/structure. Even though they talk to me because existing structures have failed them they still want to believe that existing structures work… Hard to fight that!